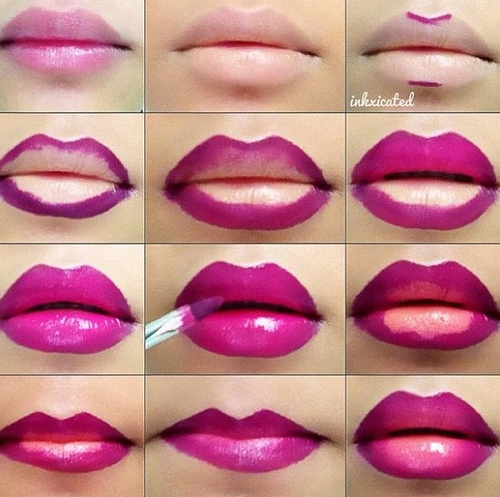 How to do the Ombre Lip! What is OMBRÉ? It’s a trend in Fashion. Two-toned hair, 2-toned nails, and now multiple toned lips! Enjoy and play as much as you want. Its a fun way if you want to add some change to your look! Ombre is French for an effect with a gradual colour transition from light to dark; for example, with hair, when the ends are deliberately lighter than the roots. Xoxo Mod Girl Sara! Using your finger, blend the lighter colour into the darker one, while being careful to leave the edges darker than the middle. An optional step. For more of a modern edge, add a clear gloss on top. 19 Feb	This entry was published on February 19, 2014 at 4:35 pm. It’s filed under HOW TO, STYLE and tagged fashion, Lips, Makeup, Ombre. Bookmark the permalink. Follow any comments here with the RSS feed for this post. Older: Beauty Tips Every Girl NEEDS To Know!